Brian started with REACT in 1996 as an EMT. 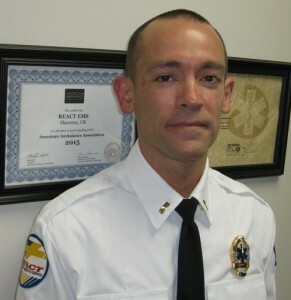 He continued his education, earning his Paramedic license in the fall of 1998. Brian has worked in many roles from Medic to Supervisor, but his true passions are patient care and teaching new Paramedics. Brian currently works as a Senior Field Training Officer and Critical Care Paramedic. A common fear of most EMS providers is the fear of being called to care for a family member. Brian’s story has a bit of a twist. Brian was working on Valentine’s Day 2009 when his unit was dispatched to an pediatric inter-facility transfer, the result of child abuse. Always a hard call to manage, the patient’s condition was critical as he had severe head trauma. Brian also recalls the emotions of caring for a child that was hurt as a result of adults’ actions. As always, Brian did an excellent job during the transport. However, you never really forget those calls. Skip ahead a couple of months. Brian and his wife, Lindsey, had been trying to have a baby for a long time. A friend recommended that they consider adopting a child who had been placed in the care of the state. Solomon, a three-year-old, was a delightful young man and they knew in an instant that he was meant for them. The adoption process— applications, interviews, home visits and court proceedings—went on for what seemed like forever. Finally, Solomon came to live with them. The State of Oklahoma realized what a great home Brian and Lindsey offered Solomon. Everyone was happy. It wasn’t long before the couple answered a phone call; the State had another young boy, about 16 months old, who needed an adoptive home. Brian says they couldn’t say no, not without knowing more and meeting the boy. It was only a short time before Brian realized that the boy he could offer a home was the same young patient he had cared for months earlier. Zach had recovered from his injuries, and had some more therapy in his future, but he was obviously a perfect match for this young family. Within the next year, the State called again. This time a lovely little girl, Gracey, needed a home. Brian and Lindsey thought that a daughter would complete their family and be a great addition to the boys’ lives. She was just as precious as the boys, and they agreed to go through the process again. Then, (as if you couldn’t see it coming), came the news that after so many years of trying to have a biological baby, Lindsey was expecting. Their family was to grow by one more. Asher was born on March 14, 2011. Seventeen months after Solomon came into their lives, their family is complete. Brian spends the majority of his off-duty time being a great dad—helping the boys work off all their energy, treating his little princess like a princess, and watching favorite videos for the 100th time. These are his favorite things to do. But perhaps the most commonly admired attribute of Brian is his constantly positive attitude. Brian can make friends quickly, with anyone from the clerk at the store to the surliest patient to the busiest physician. He never complains about a call, no matter what time of day. REACT appreciates Brian for everything he does for his patients, for being a great role model, and for inspiring all of us who are privileged to work with him.